Those who start crossing the street when the countdown clock is flashing are at risk of getting a jaywalking citation. Police say it is an effort to enhance public safety. DOWNTOWN LOS ANGELES - It’s that time of year again: Downtowners have dug out their holiday decorations and are taking to the streets in search of the perfect gift for friends and relatives. It turns out, it’s also that time of year for the Los Angeles Police Department: In an effort to enhance public safety, officers have begun an intense crackdown on jaywalking in the Historic Core and the Financial District. The veritable lumps of Christmas coal run usually from $190 to $250, authorities say. LAPD Traffic Division officers are warning Central City residents and workers that you don’t need to be crossing against a red light to receive a citation — simply stepping off the curb while the countdown clock ticks could result in a ticket, said Lt. Lydia Leos. “We’re heavily enforcing pedestrian violations because they’re impeding traffic and causing too many accidents and deaths,” Leos said, noting the department tickets jaywalkers year-round, but during the holiday season more people come into Downtown and aren’t paying attention to the rules of the road, which increases the number of citations. Since Jan. 1, 2013, the LAPD has recorded four pedestrian deaths and 129 vehicle-pedestrian accidents in Downtown, Leos said. LAPD statisticians do not break down citations by individual division, but this year officers from Central Bureau, which includes Central, Hollenbeck, Newton, Rampart and Northeast divisions, dispensed 31,326 citations. Leos acknowledged that California’s vehicle code is stricter than many other states with its pedestrian rules. Although the tickets are ruffling feathers throughout Downtown, Leos said police categorize the citations as a way to educate the citizenry. She added that Central Division has posted pedestrian rules on its Facebook page, and spread the word through other social media formats. That doesn’t cut it for some Downtowners, including Anthony Bejarano. The Financial District resident, a lawyer, has seen people become incensed after being ticketed at Seventh and Figueroa streets. The citations seem to be happening on a weekly basis, he said. According to California Vehicle Code 21456, pedestrians can’t walk if there’s a “Don’t Walk” sign or an upraised hand symbol. Anyone who has started crossing after one of those flashes should proceed to a sidewalk or safety zone. Others riled by the crackdown include longtime Downtown resident Edgar Varela. In 2010, Varela recalled walking east at Seventh and Hope streets with 16 seconds showing on the traffic signal. He said the “Walk” signal had expired, but the countdown continued. He saw officers in the intersection, locked eyes with one, and proceeded to cross. The officer gave him a $197 ticket, Varela said. Varela took down the officer’s information and photographed all the poles and crosswalks at the intersection. Varela believes this evidence helped him to have the ticket dismissed. “I was appalled that instead of educating the public on this obscure technicality on crossing the street, the LAPD found this to be a way to generate funds and polarize local residents while discouraging pedestrian traffic,” he said. Alarmed at the number of residents’ complaints, Blair Besten, executive director of the Historic Core Business Improvement District, brought up the topic recently at a previously scheduled meeting with Capt. Ann Young, who oversees the LAPD Traffic Division. Besten sees a need for enforcement, but questions how many people know that stepping off the curb could mean stepping into a hefty fine. Besten is pushing for a community meeting where LAPD traffic representatives will answer questions. The session is still being planned, but authorities are looking to host it in the Historic Core in the near future, Besten said. For now, the only way to be certain to avoid a ticket is to cross on green, and to stay on the sidewalk when the countdown clock is ticking. Jaywalking tickets are one of those dumb, embarrassing things about Los Angeles that non-Angelenos love to laugh at us about, and oh man they are so right on this one. Why does the LAPD put so much effort into catching supposed jaywalkers? And we do mean supposed: "you don't need to be crossing against a red light to receive a citation — simply stepping off the curb while the countdown clock ticks could result in a ticket," according to the Downtown News, which reports that the LAPD is specifically cracking down in the Historic Core and the Financial District for the holiday season. And so just stepping off the curb during the countdown--while it is still technically legal to be in the crosswalk--can earn you a ticket ranging from $190 to $250. 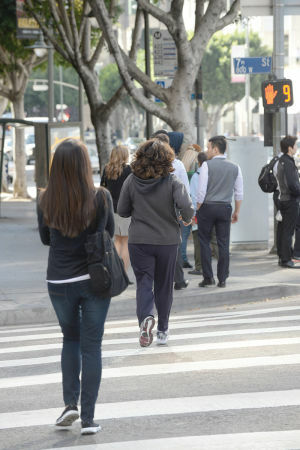 Obviously walkers should always cross as safely as possible, but an LAPD lieutenant says "We're heavily enforcing pedestrian violations because they're impeding traffic and causing too many accidents and deaths." Meaning the LAPD blames pedestrians for creating both car traffic and car accidents, and will charge people $200 a pop to try to make them stop creating those things. Somehow the 31,326 jaywalking citations issued in the Central Bureau this year didn't prevent four pedestrian deaths and 129 vehicle-pedestrian accidents in Downtown.